Exquisite and stunning complete restoration and renovation of circa 1900 Craftsman 2 story in the heart of the sought-after neighborhood of Crescent Hill. 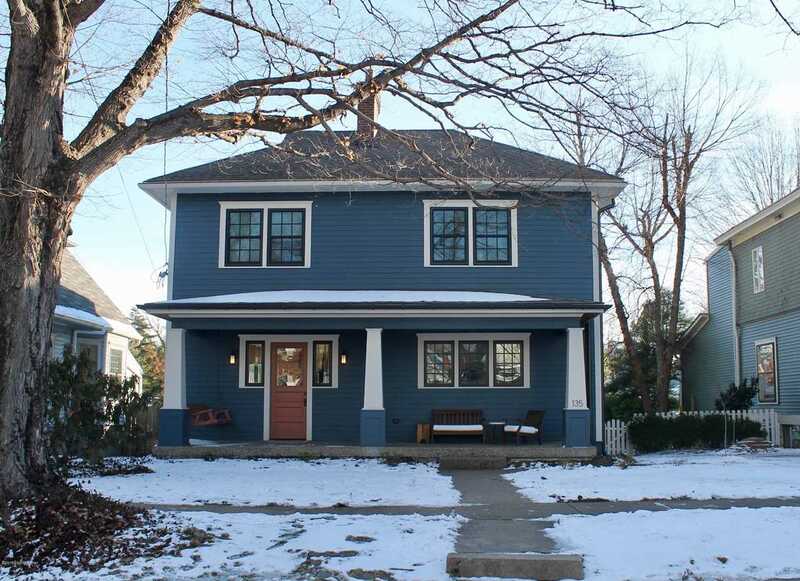 The extreme make-over in 2015 included almost all new windows, Hardie board siding, mostly updated plumbing and electric (including new panel) and moving the front door to create an entry foyer with a lovely, enjoyable covered front porch. The bead board stained ceiling, over-head fan, and porch swing add comfort and charm to this fantastic outdoor space. Upon opening the front door, you will step into the newly designed foyer with beautiful fireplace with tiger oak mantel and a window seat flanked by coat closets. Gorgeous hardwood floors run throughout the first floor. This inviting entry flows directly into the butler's pantry with brick accent wall, a full-size laundry closet and marble topped cabinets for extra kitchen storage. Across the rear of this stellar home is the stunning custom kitchen with solid slate counter tops, white subway tile backsplash elevated to the ceiling, recessed lighting, cleverly designed cabinetry (some with glass faces), and crown molding. You are going to love the GE monogram gas cook top, Whirlpool dishwasher, GE Advantium ovens and refrigerator. The dining room with recessed lighting and a custom chandelier is surrounded by windows and offers a window seat for extra seating and storage. The back of the home opens to an expansive cedar deck and overlooks the huge fenced yard with an old style 1 car garage that is being used as a storage shed for all your lawn and garden equipment. To the right of the entry foyer is the beautiful living room with crown molding, another gorgeous fireplace and "smart" features that include a home Nest Thermostat system and smart accent lighting. The staircase to the 2nd floor is located between the formal living and dining room and has a small office nestled under the stair risers. There is also a first floor half bath located in this area. Upstairs you will find 3 generous bedrooms and a lovely full bath with white ceramic floor and new subway tile tub surround. One of the bedrooms offers double closets and a central fireplace, while another bedroom features wonderful original built-in drawers and closet space. The second floor boasts original refinished yellow heart of pine flooring and a 2nd floor deck that overlooks the rear yard. This is a stunning home that is ready to move right in. The 60' X 160' oversized lot with alley access offers plenty of room for garage and additional off-street parking. The driveway to the right of this home is part of the property as well  one of only two driveways on the street. Average utilities over the last twelve months has been approximately $180/month. Directions:Frankfort Ave. to street or Brownsboro to Birchwood, right on Field, left on Bayly. SchoolsClick map icons below to view information for schools near 135 N Bayly Ave Louisville, KY 40206.